Eric absolutely loves being a DJ and providing his guests with the amazing service that they desire. 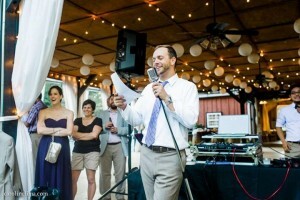 In 2005, Eric started All Around Raleigh DJ, a mobile disc jockey and wedding entertainment company. All Around Raleigh DJ specializes in wedding receptions but, of course, the team will DJ every kind of event that needs great music. Eric loves every type of music and the instant memories that pop into your head when you hear a song. If you are looking for a high-quality DJ for your event that you can trust to show up on time, put on a great show then All Around Raleigh DJ is a great fit. Eric is originally from Wisconsin and moved to NC in 1999 to join the US Army 82nd Airborne. In 2005, he started attending NC State University where he earned a degree in Chemical Engineering. He created the All Around Raleigh DJ Company with a few dollars that he saved up while in the Army. Contact Eric at All Around Raleigh DJ using his contact form. The most amazing thing about what I do is that I get a chance to play a role in the most memorable day of our clients’ lives. I remember my own wedding day and how incredibly fun and memorable it was and I hope everyone has the same experience that we did. Your DJ should be fun, professional, organized and outgoing. Your wedding music should be upbeat and flow well together and be the perfect soundtrack for your wedding day. Whether the moment is relaxed or you are really dancing hard, the music should compliment that perfectly. Just the right blend of originality and classic wedding music is key and is different for every client. My wife Kelly and my baby daughter Nora and I live in Cary with our two wonderful dogs. I have it so good! I’ve done just about everything and I am so happy to be in a career that I love! I graduated from NC State with a BS in Chemical Engineering in 2008 and did engineering for 2 years before taking All Around Raleigh DJ Company really seriously full-time. Before NC State, I was in the US Army’s 82nd Airborne Division for 4 years and before that I grew up in Wisconsin and lived there until I went to basic training at 22 years old. Just about everything is good with me from classic home cooking to the different and exotic. I guess I like to try some unknown flavors now and then but usually a home cooked meal is my style. I can’t help but to do push-ups and sit-ups and run as much as I can. Great questions for a DJ! It always depends on the moment and the mood. Zac Brown Band is probably one of my recently favorites. Oh and don’t forget about Johnny Cash, too (I did name my dog after him)! Too many to list! Be good to your clients and they will be good to you. Find a career that you have passion for and the work will never, ever wear you out! I’ve been to most of the US and most of the Caribbean. Puerto Rico is stunning just make sure you get out of San Juan and visit the west coast. Kelly and I think that Europe is next on our list. I’d love to see the coast of France where we landed on D-Day. These days if I can take a day off to take my daughter to the pool then that is a success! I’d probably include reading and running in there too. Does organizing count? Snacks: Honey Mustard and Onion Pretzel pieces….ridiculous! Flying would be it. I parachuted quite a bit when I was in the Army and that feeling is almost overwhelming. What is something you could not live without? A sense of purpose each and every day! I think this particular time in history is incredibly exciting but maybe sometime during ancient Rome or Greece’s height of civilization. I bet it was way more advanced than we think it was. If you could have lunch with anyone in history, who and why? Beverage of Choice Coffee or tea?